PEARL, MS - After back-to-back postponements due to inclement weather, the M-Braves (3-5) and Mobile BayBears (4-5) split a doubleheader on Sunday to close out a shortened four-game series. Runs were at a premium all day with the M-Braves notching a 1-0 shutout victory in game one, and Mobile returning the favor with a 2-0 shutout that took eight innings in game two. Mississippi pitching surrendered just one earned run over 15 innings on Sunday with 18 strikeouts and 10 walks. At one point, the BayBears were blanked for 18 consecutive innings. Cristian Pache ran his hitting streak to five games finishing 3-for-7 with a double and run scored during the twin bill. Kyle Muller waited three days to make his second start of 2019 and the 20-year-old came out firing in game one. Muller struck out seven over the first three innings, but had trouble with command, walking four and using 76 pitches (38 strikes) over 3.1 shutout innings. Jonathan Aro relieved Muller in the fourth inning and walked four, but fired 1.2 scoreless innings to keep the game scoreless. The Braves plated their lone run in the bottom of the sixth inning. Pache reached on a bloop single and then stole second, his fourth in eight games, and advanced to third on a throwing error by Mobile catcher Julian Leon. C.J. Alexander lifted a fly ball deep enough to left, allowing Pache scare and provide the Braves with a 1-0 lead. That was enough cushion for Josh Graham , who struck out two and walked one over the final 2.0 innings to get his first win of 2019. Game two was much of the same as Patrick Weigel made his second start of the year and did a nice job over 2.0 scoreless innings. Still limited by a low pitch count returning from Tommy John Surgery. Weigel struck out one and walked one, scattering two hits after tossing just 0.2 innings in his first start. Jeremy Walker (L, 0-1) was brilliant behind Weigel but suffered a tough-luck loss. The right-hander is the lone Braves pitcher to log 5.0 innings in an outing and he's done it twice. Walker dealt 4.0 scoreless frames before extra innings. Mobile's Jamai Jones began the eighth inning at second base and scored on Mobile's three straight hits. Brandon Marsh scored a second run on a sacrifice fly by Roberto Baldoquin that was dropped in right field to provide insurance. Walker struck out six and walked none in the loss. 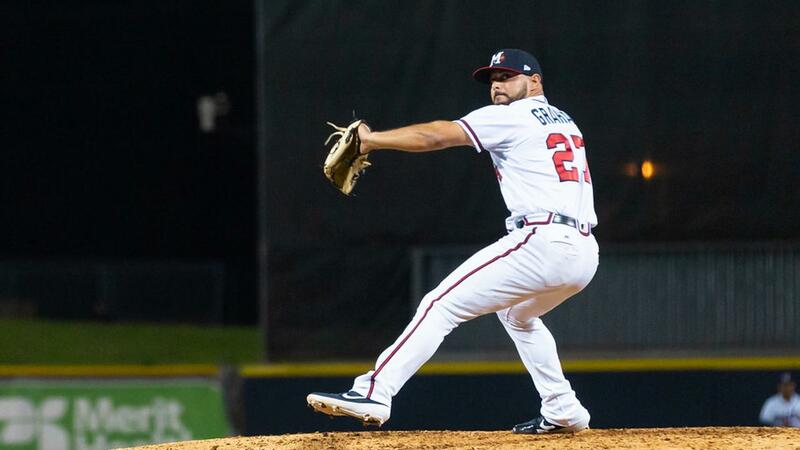 Mobile's Patrick Sandoval started game two for the BayBears and struck out a career-most 11 M-Braves in the no-decision Joe Gatto (W, 1-0) and Ryan Clark (S, 1) combined for 3.0 shutout innings to earn the win and save. The two clubs combined to strand 31 runners on base Sunday and go 3-for-17 with runners in scoring position. The M-Braves hit the road again for a five-game series at Chattanooga beginning on Monday night at AT&T Field. LHP Joey Wentz will make the start for Mississippi against RHP Jordan Johnson for Chattanooga. First pitch is set for 6:15 pm CT with coverage beginning at 6:00 pm on 103.9 FM and the TuneIn Radio app.